Two Christian Churches and a school were ransacked and torched in the wake of cartoon protests in Sukkur, Pakistan on Sunday. 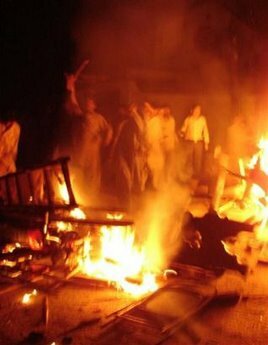 Protesters ransacked two churches in the city, Salahuddin Haider, the Sindh government spokesman, told AFP. “They were trying to burn the churches but police dispersed the crowd,” he added. Haider said that trouble began after accusations were made that a Christian teenager had thrown pages of the Holy Quran in a dustbin. Protesters blocked roads by burning tyres, he said, adding that paramilitary troops had been called. 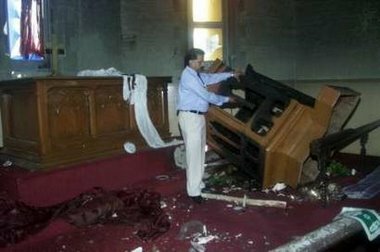 AP Adds: One man was injured when police fired tear gas to disperse around 400 people who attacked the church, said Akbar Arain, the local police chief. Arain did not say what injuries the man suffered or how serious they are. There were no worshippers in the church and a private security guard fled the building when it was attacked, said Aftab Hale Pota, chief of Sukkur district police. SM Wajih adds: Police resorted to teargas and aerial firing to disperse a mob, which forced traders to shut down shops, following reports of alleged ‘desecration’ of a copy of the Holy Quran by a Christian man from Freek Hill in the C Section Police precincts in Sukkur on Sunday. More than 100 people were arrested on charges of damaging public property, including a church and schools. Later, Rangers were called in who help bring the situation under control. 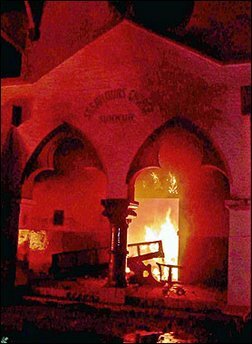 The Pakistani Chrisitan says that the two churches were set on fire and that Christians were beaten all in the presence of police. All Pakistan Minorities Alliance Chairman Shahbaz Bhatti said that besides the attacks on St Xavier Church and St Mary’s Catholic Church, the mobs have ransacked pastoral residences, Holy Bibles and other Holy books. Tens of thousands rallied in the Turkish city of Istanbul and complained about negative Western perceptions of Islam. Well,… Yeah! For starters, it would help if Muslims quit torching Christian Churches!